Patricia Nelson would like you to see HAY! HAY!! HAY!!! Last Chance Horse and Pony Rescue and Sanctuary hasn't added a story. This is Floyd with the Founder of the Charity, Sharron. Floyd is 31 years old. He is a thoroughbred who raced in the United States. When Floyd came to us he had been left in a field to starve. When he first arrived he wouldn't eat. Sharron stayed in his stall with him for days and nights hoping to coax him to begin eating. She succeeded. He weighted 700 pounds. He is now at his best weight and with lots of love and kindness he is enjoying his retirement at our farm. We have 36 similar heart-breaking stories. Stories that leave you weeping. 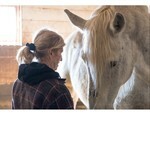 Several of our horses are seniors and need lots of veterinary care which is very expensive. They also need medications and various injections. HOWEVER, they most importantly need to eat. HAY can also be very expensive so we are launching this campaign seeking HELP TO PAY FOR HAY to feed our animals. They eat lots of HAY every single day. Please visit our website at www.lchpr.org to meet our other fabulous horses, ponies, minis, donkeys and Charlie our cow. You'll love them as much as we do, I guarantee it! You can also find us on Facebook. Last Chance Horse and Pony Rescue and Sanctuary hasn't posted any updates yet. Last Chance Horse and Pony Rescue and Sanctuary is managing the funds for this campaign.